A "Bee" frees your time the year 'round lets you enjoy more leisure.., lets you get the outdoor work in comfort and convenience. You'll find you're doing far less hand trimming because this mower cuts to within 5/8 ill. of obstructions, on the right side. And you can adjust it to a precise cutting height. The 6-in.-deep housing lets you cut through heavy growth without plugging ..... not like others with a shallow housing. 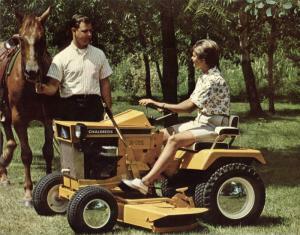 The mower attaches to the front axle so, as the axle pivots over dips and ridges, the mower follows. 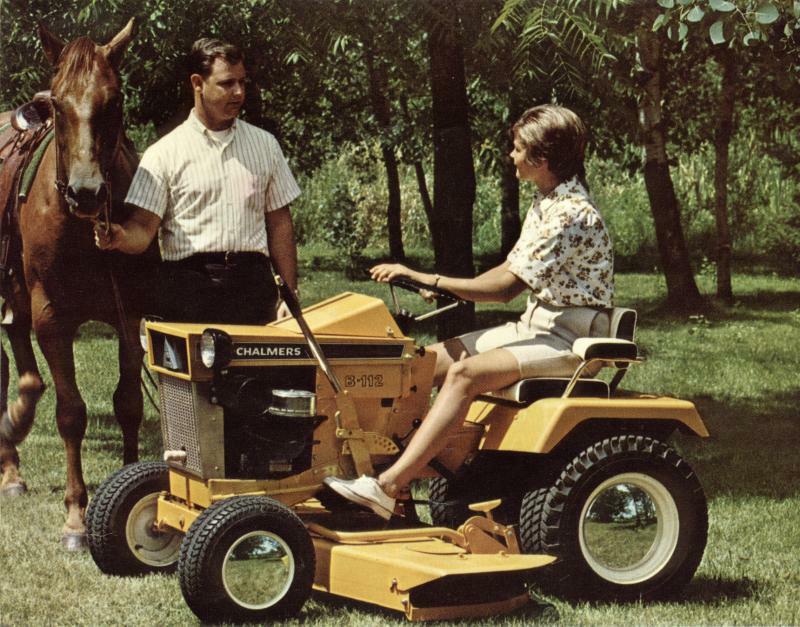 It conforms to every irregularity to keep your grass smooth and even through front wheel control. ** Here's your primary selling feature. No Scalping! 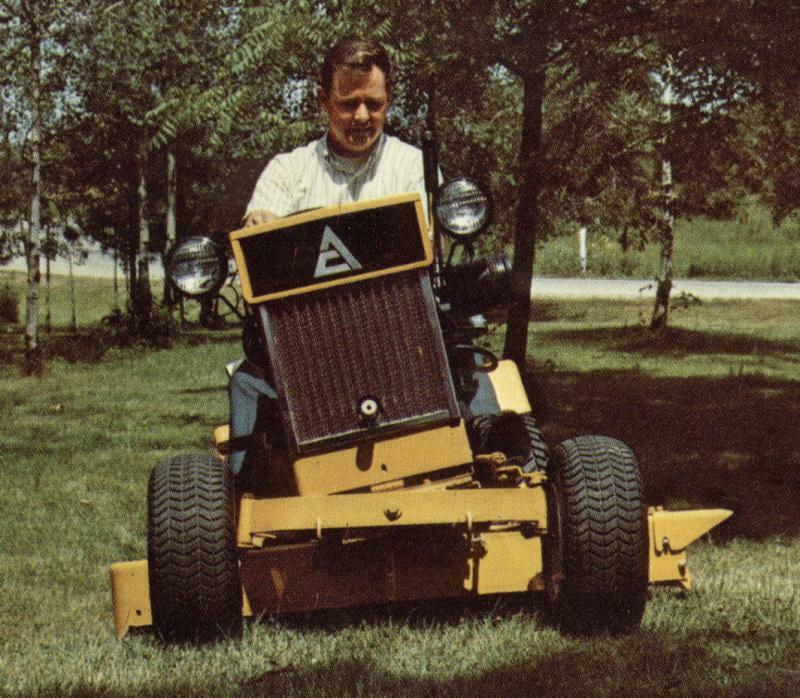 The mowers are attached to the front axle and not the factor frame. This is a patented exclusive feature. As the front axle pivots over clips and ridges, the mowers conform to the irregularities by front wheel gauging. Rubber rollers on nylon bushings gauge the rear of the mower pan and are adjustable to change the height of cut. Mowers are driven from the center PTO clutch. 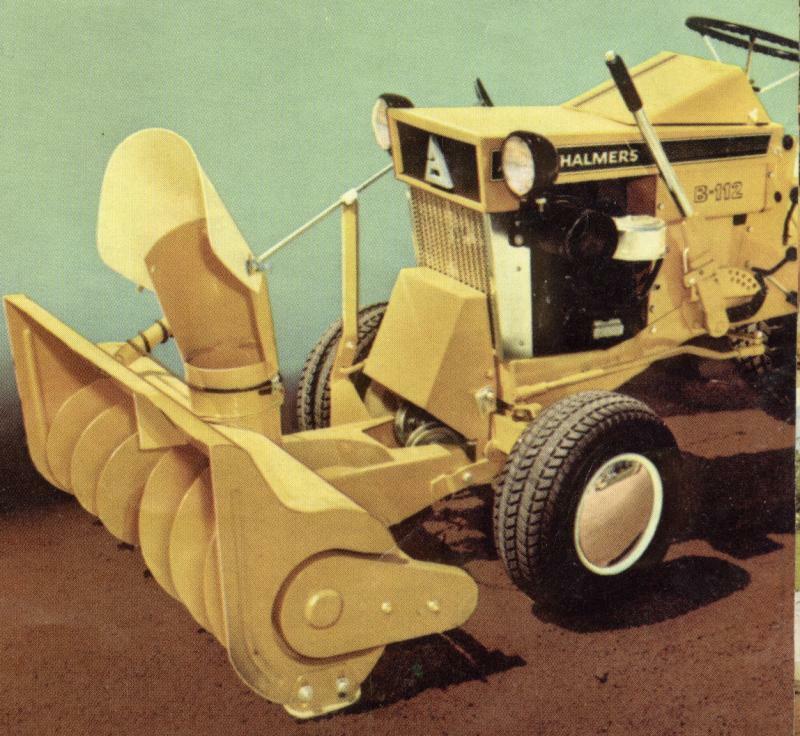 A longer belt is required to drive a 42" mower on the B-112. 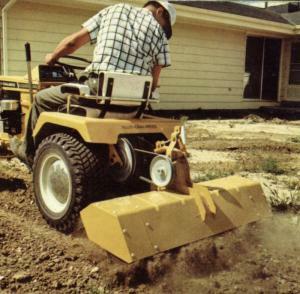 42" Mower for the B-110 and B-112. 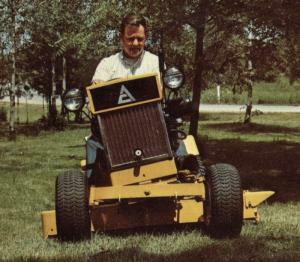 48" Mower for the B-112 only. You'll get better planting and growing results if you break up and blend the soil with a husky rotary tiller. Non-clogging tines are guaranteed not to break. Standard width is 32 in. but you can add extensions to 42 in. Use it for cultivating after plants are up, too. ** Use for ground breaking to 9" depth or for cultivating between rows. The rear tractor PTO drives the tiller through a belt clutch. 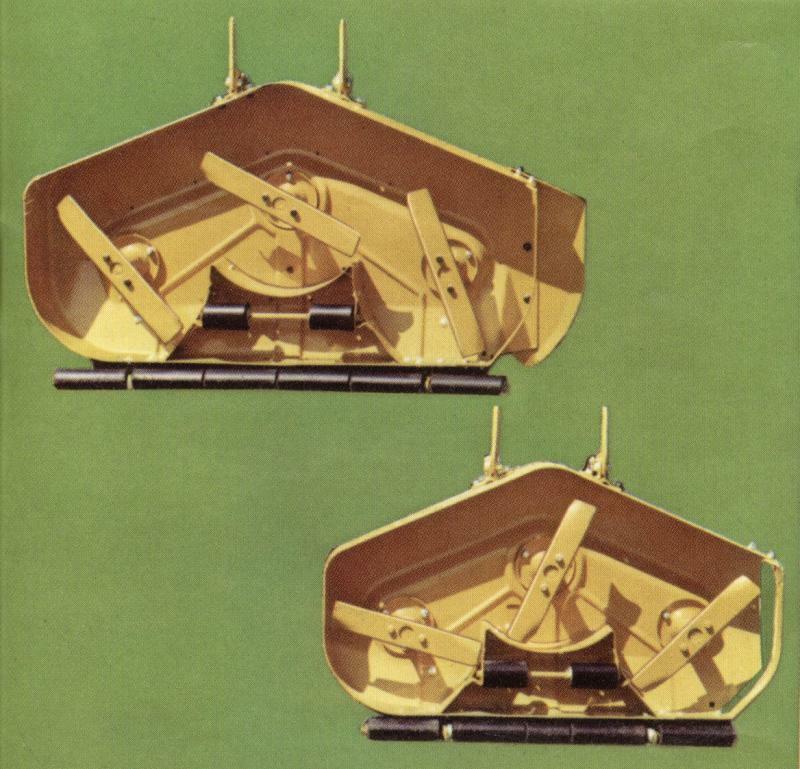 A tiller hood completely covers the tines and assists in breaking up and blending soils. Standard width is 32". Optional tine and hood extensions increase the width to 42". Tines are self sharpening and guaranteed against breakage. A gear reduction box allows tilling under the roughest conditions with almost no loss of driving power. A Hi-Lo transmission is recommended to slow ground speed on the B-110. There are three interchangeable blades with the leading blade placed ahead of the other two for an overlapping pattern. The cutting path is wide and uniform and no special timing is needed. ** The steel housings are 6" deep, allowing great amounts of cut material to be exhausted without "plugging". Permanently lubricated bearings insure long blade spindle life. A spring loaded idler maintains proper belt tension on the blade spindles and protects them from danger. The big 36 in. snow thrower for B-110 or 42 in. for the B-112, can power through a ton of snow in 60 seconds and throw it as far as 60 feet away... and you'll leave no high banks to encourage further drifting. The discharge arc adjusts over 190° and the chute can be rotated from the tractor seat. The snow thrower is a direct action machine. The single high-speed auger is fed by the forward motion of the tractor, compresses snow and slings it up to 40 ft. away. The arc of discharge is adjustable from 0° to 78° and the discharge chute is rotated from the tractor seat 270°. The single belt drive and drive clutch are completely shielded from ice and snow. Drift cutters, adjustable skid shoes, and replaceable scraper edge are standard equipment. Capacity is 1 ton of snow per minute. A full direct action auger 42" wide for the power full B-112. 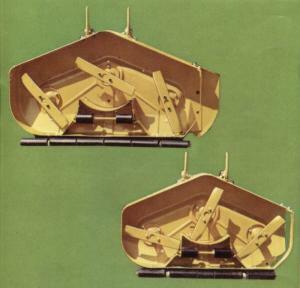 Capacity 1¼ ton of snow per minute, shape of auger housing eliminates drift cutters. Slings snow up to 60 feet. The arc of discharge is adjustable from 0° to 78° and the discharge chute is rotated from the tractor seat 270 o. The single belt drive and drive clutch are completely shielded from ice and snow. Adjustable skid shoes, and replaceable scraper edge are standard equipment.